Experiments made by a Mr. Hodgkinson in 1842 revealed the relative weakness of cast iron beams compared with wrought iron and thereafter it was proposed that cast iron girders should �be trussed with wrought iron bars. The first bridge of this kind was �over the River Lea between Lea Bridge and Ferry Lane. Robert Stephenson, with George Bidder, designed this first trussed compound girder bridge of 60 feet span carrying the Northern and Eastern Railway over the River Lea at Tottenham, south of Ferry Lane.�Stephenson and his associates played a leading role in the transition from cast-iron to wrought-iron bridge designs. The bridge over the Lea was the first of many trussed compound girder bridges, a design which was later discovered to be flawed after the catastrophic collapse of the Dee railway bridge in 1847 with the loss of six lives. This disaster sent shock waves through the engineering profession and shattered the public's confidence in innovative railway bridge technologies. James Walker, architect of the Lea Bridge of 1820 prepared a report on the failure for the Commissioners of Railways with a Captain Simmons. The bridge was subsequently replaced with a conventional girder bridge. The partnership and friendship between George Bidder and Robert Stephenson, later described by Stephenson as "the long and satisfactory private as well as professional friendship", lasted until Stephenson's death in 1860. As well as an association with the construction of the Victoria (London) Docks, G.P. Bidder became the engineer for the North Woolwich Railway that ran from Stratford to Thames Wharf and later, to North Woolwich. 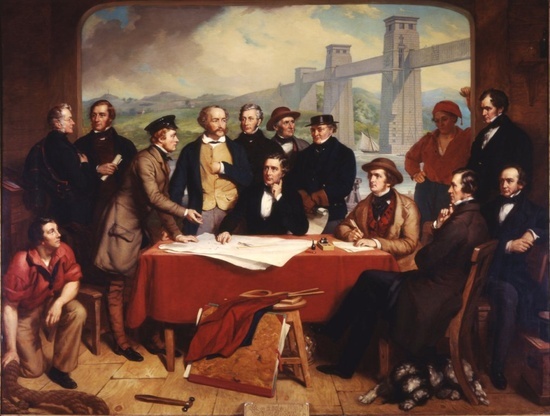 History of Bridge Engineering. Henry Grattan Tyrrel. Published by the author. Chicago 1911. George Bidder Obituary memoir.�Minutes of the Proceedings,Volume 57, Issue 1879, 01 January 1879 , pages 294 –309. Report to the Commisioners of Railways by Mr Walker and Capt. Simmons R.E. on the fatal accident on 24 day of May 1847, by the falling of the Bridge over the river Dee, on the Chester and Holyhead Railway.